Barbican resident Peter Savage updates us on the construction of the Elizabeth Line (Crossrail), which runs under the estate, and offers Barbican reidents direct access to the new rail link with stations at both the eastern (Liverpool Street/Moorgate) and western (Farringdon) ends. 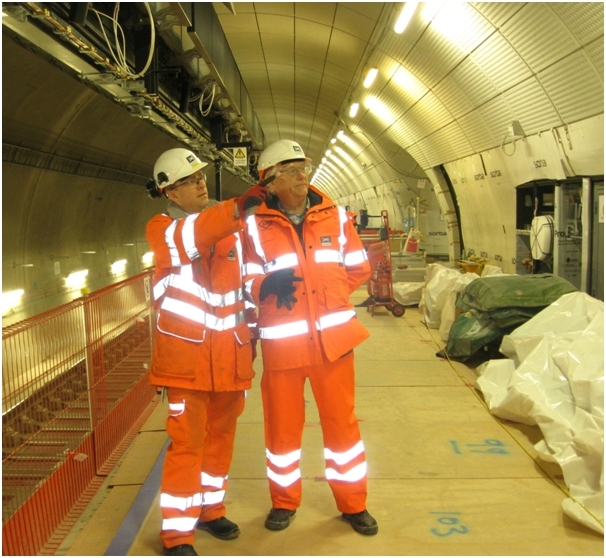 Peter visted the Farringdon site to view the latest progress. Later this year we can look forward to 82,000 people a day using the new Elizabeth Line Farringdon station when it opens in December. 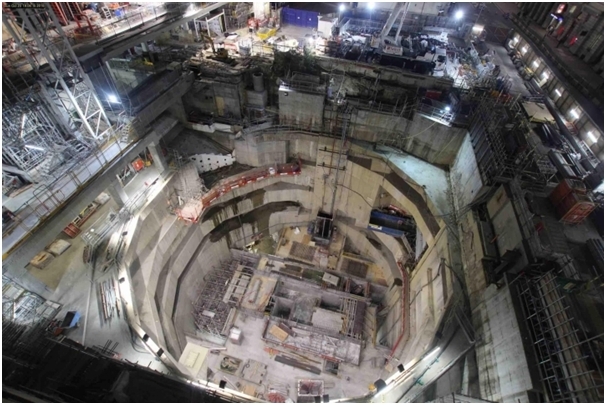 150,000 people a day are expected to use the Farringdon interchange to connect with the London Underground and ThamesLink services. Crossrail is currently Europe’s largest infrastructure project running over 117 km from Reading and Heathrow in the west to Shenfield and Abbey Wood in the east at a cost of £14.8 billion and is on time and on budget. More than 10,000 people have worked on the project since it started in 2009 including 710 apprentices. One third of staff are women. Crossrail, in partnership with Women in Engineering, has recruited women into all areas of construction from entry level trades roles through to professional construction placements. Tunnelling finished in June 2015 and the project is now focused on fitting out the stations and tunnels and testing the equipment and systems needed to operate the railway including the installation of track, signalling, escalators and architectural finishes in the station ticket halls and platforms. The two platforms at Farringdon have been constructed 30 metres (nearly 100 feet) below ground. At either end of the platform tunnels the new station’s two ticket halls in Long Lane and Cowcross Street are taking shape with design features and art installations reflecting local history. The ceiling of the Western ticket hall in Cowcross Street has a diamond pattern referring to the nearby jewellery quarter while the geometry of the ceiling reflects the geological fault line below the station and the River Fleet. 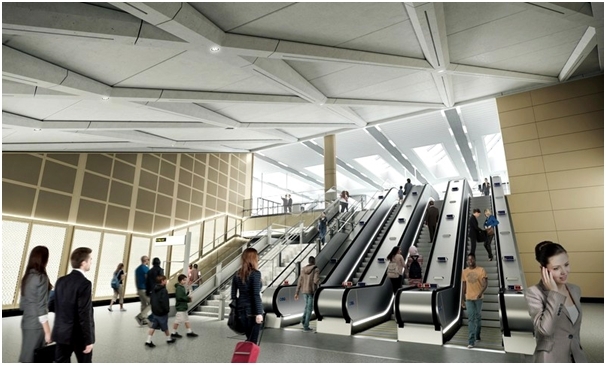 Crossrail passengers will enter and leave the station via the new ticket hall opposite the Metropolitan line London Underground station which opened in 2011. The “urban realm” scheme includes creating a pedestrianised space in Cowcross Street and removing all street furniture other than a narrow central furniture and tree planting zone. At the Long Lane station the concrete coffered ceiling reflects the Barbican’s brutalist architecture. Bronze-coloured stainless-steel wall panels will help to absorb noise while the decoration on the sliding screen gates, which separate the platform from the track, are derived from a barcode reading ‘Farringdon’. New housing, shops and offices will increase local facilities. 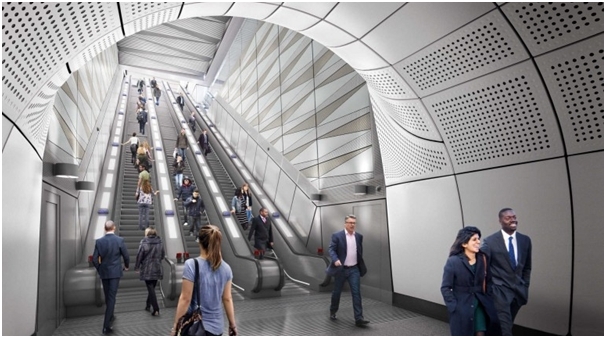 A lift will connect the western end of the west bound platform of the Barbican Underground station with the middle concourse of the eastern end of the Elizabeth Line. At the Moorgate end of the complex there will be a Moorgate ticket hall connected to the existing Moorgate underground and National Rail station with its main ingress in Moorfields and this will access the Liverpool Street Elizabeth Line platforms located under Finsbury Circus – so between the existing Liverpool Street and Moorgate stations. Thus stretching from Moorgate in the west to Broadgate in the east, the Elizabeth line ticket halls are connected by two mined platforms. Fully accessible ticket halls provide direct interchange with the Northern, Central, Metropolitan, Circle and Hammersmith & City lines, as well as National Rail services to Stansted and Southend airports. The western ticket hall (Moorgate entrance) is at street level and accessed through an angular portal entrance, framed by bold blue coloured glass. Glass panels and acoustic panels made from perforated enamel steel will be used on walls, while terrazzo will be used for the floors. The ticket halls at either end of the new Liverpool Street station have also had special precast ceiling structures installed. These are grooved, angled ceilings that have been designed to create a sense of space, and reflect the traditional pin striped suits of City workers. The safety record of this project has been truly remarkable. One reason for this has been the emphasis on safety and a “learning legacy”. This has been achieved by an overriding policy objective that: “We all have the right to go home unharmed every day; we believe that all harm is preventable and we must all work together to achieve this”. Acknowledgement: I thank Andrew Dempsey (Crossrail Media Relations) for arranging my visit to Farringdon station and Andy Scholes (Farringdon Site Manager) and Wendy Franks (Community Relations Officer) for showing me around. Following on from the previous article a new report suggests that the benefits of the new Elizabeth Line cross-London east-west railway will be even higher than initially reckoned. In the Barbican we will have already noticed some of this in the building and/or planning of new commercial and residential buildings in close proximity to the Estate, which are utilising the prospective benefits of the Elizabeth Line in their justification and marketing to prospective occupants. Indeed the go-ahead for some was not finally taken until it was certain Crossrail was actually going to go ahead. With the line due to open in less than a year, property consultancy GVA has published new research that shows the impact of the Elizabeth line will be significantly greater than previously predicted in 2012. £10.6 billion increase in property values within 1km of a station expected by 2021. Jo Johnson, Transport Minister, said: “We already know the impact the Elizabeth line will have on rail capacity in London, with half a million passengers every day benefiting from state-of-the-art trains and brand new connections, including faster links to Heathrow, Gatwick and Luton airports. The ceiling patterns here shown in this CGI of one of the near-Barbican entrances are supposedly based on the brutalist steel and concrete structures of the complex. With Elizabeth Line stations at both the east and west ends of the complex. Barbican residents will be in a prime position to be affected advantageously by the new rail link. We already have some of the best transport links for any London residential complex with north-south and east-west underground rail links and bus services at each end of the complex, and the Elizabeth Line will further enhance these and undoubtedly give a boost to property values currently perhaps suffering a little from pre-Brexit worries and other government moves on buy-to-let and stamp duties affecting, in particular, higher value properties. All in all the benefits accruing to property values in the Barbican Estate could be substantial with travel times to key office developments like Canary Wharf coming down to 6-10 minutes thus enhancing our City Centre location, with its good transport links and ever-growing nightlife appealing to young professionals. Heathrow will be just under 40 minutes away by direct rail link rather than requiring rail link, or underground, changes, which will benefit the Barbican’s international travellers. A total of six Elizabeth line trains per hour will serve Heathrow Terminals from December 2019. Four will go to Terminals 2, 3 and 4 and two will go to Terminals 2, 3 and 5.When the service is fully operational in December 2019, Elizabeth line trains will provide a direct link between the airport and central London destinations including Farringdon and Liverpool Street. 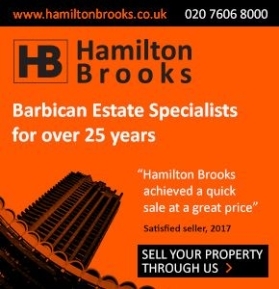 Barbican apartments are often larger than similar priced properties elsewhere in London and with the gardens and lake enhancing the environment the appeal should increase further. Having the City Corporation as the ultimate landlord is also seen as beneficial. We doubt property values will advance immediately, but once the Elizabeth Line is fully operational in 2019 the benefits should start becoming apparent.